Obama cut his Hawaiian Christmas vacation short to contend with the looming January 1 crisis, as Republicans and Democrats traded blame and the White House reportedly lashed out at the “congressional stupidity” gripping the capital. Six days earlier Obama had urged Congress to end a deadlock over how to avoid the hundreds of billions of dollars in tax hikes and spending cuts that kick in at the start of the year if Congress fails to act. The situation has spooked US and global markets, left Americans wondering whether they will pay thousands more in taxes next year, and worried the Pentagon, which fears defence cuts could seriously undermine the military. Complicating efforts to avoid fiscal disaster, Treasury Secretary Timothy Geithner warned that his department will need to take “extraordinary measures” to postpone the day the government could default on its liabilities. Geithner said in a letter to Senate Majority Leader Harry Reid that the nation will reach its statutory $16.39 trillion debt limit on Monday, 31 December. His measures would create some $200 billion in headroom that under normal circumstances would last about two months, to the end of February. “However, given the significant uncertainty that now exists with regard to unresolved tax and spending policies for 2013, it is not possible to predict the effective duration of these measures,” Geithner said. Experts say a failure to strike a fiscal cliff compromise by New Year’s Eve could plunge the world’s biggest economy into recession, and wrangling over the debt ceiling will only exacerbate the uncertainty. But members of the House and Senate have shown no signs of nearing any accord. Email “Holiday's over: Obama returns to Washington to deal with 'fiscal cliff'”. 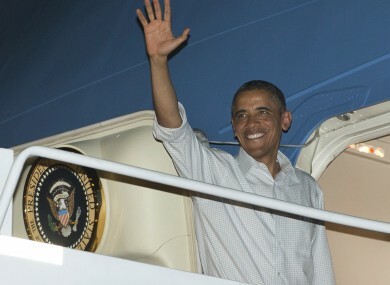 Feedback on “Holiday's over: Obama returns to Washington to deal with 'fiscal cliff'”.